If you need safe moving or gun safe moving from one residence to another in Southern California, or even out of state, our safe moving service can handle your needs. Our own professional West Coast Safes installation crews take every precaution and use specialized equipment to move your safe without damaging it. To receive a quote from our safe moving experts, contact us or call us at (800) 933-3515. Please be prepared with the make, model, and size (such as Liberty Lincoln 25) of the safe to help us with your safe moving questions. If you are unsure of these, please have its dimensions and weight. For local Southern California ground floor to ground floor moves, our minimum gun safe moving rate is $300. Size, weight, additional steps or stairs, and long travel distances will increase the cost accordingly. Our safe moving service includes unbolting your safe, wrapping/boxing it to protect its finish, transporting it, protecting your flooring and thresholds as needed, shimming it level, and anchoring it to the floor (if possible/wanted). 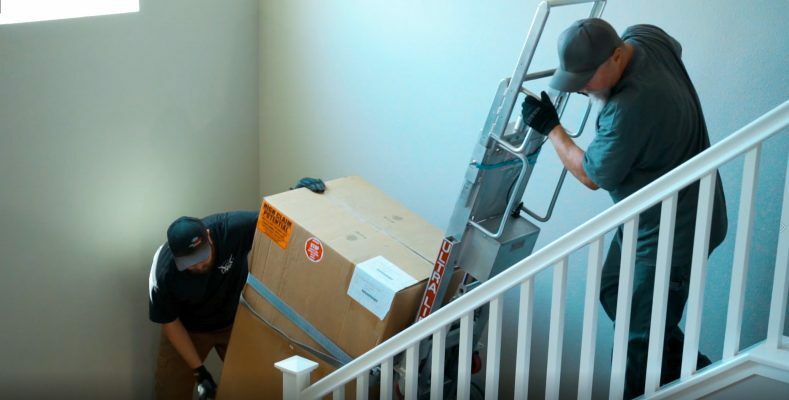 To get an idea of what our delivery and installation service looks like, you can check out our Delivery Information page or click HERE to watch our delivery video. For out of state safe moving there are a number of options. If you are taking a moving truck or a pod with you, we can unbolt your safe, wrap/box it to protect its finish, put it on a pallet, and load it up for you. This gun safe moving service starts at $200 for safes on the ground level and increases based on size, weight, and any additional steps or stairs. We can also bring your safe back to our shop, package it for shipping, and send it to your new residence via LTL Freight. This service is curbside only and does not include unpacking, setting up, or installing your safe at your new residence. Lastly, we can have your safe shipped via LTL Freight to an installer near your new residence so that they can perform the installation for you. For these two options, we charge a minimum of $200 plus packaging and freight costs. If you choose to have your safe moving done professionally at the new location, that charge will be decided by the installer in that area.